Tignish, April 5 – Access to mental health professionals and care will be significantly improved under a new Liberal government. An additional $50.8 million specifically earmarked for Prince Edward Island in the recent federal budget will allow the province to go even further in the delivery of mental health and addictions care. 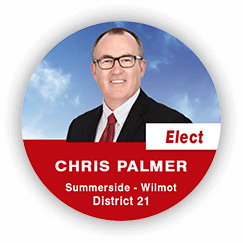 “The most important aspect of mental health services is ensuring that Islanders in all parts of our province have access close to home,” District 27 Liberal Candidate Hal Perry said. The proposed Tignish walk-in clinic will be added to the current list, which includes Montague, Charlottetown, Summerside, Lennox Island, O’Leary and Elmsdale. Over the next five years, the Liberal plan for healthcare includes a $100 million investment in mental health and addictions. “We are confident that our community-based plan for mental health will result in the best access to services anywhere in Canada,” MacLauchlan said.